There's been a pretty big shake-up in the world of TV animation, with a number of the biggest names such as Phineas and Ferb, Gravity Falls and Wander Over Yonder either ending or announced as coming to an end in the past year or so. Now it has emerged that Cartoon Network's Regular Show will be the latest major series to come to the end of the line- and that its upcoming 8th season would be its last. The series, created by JG Quintel, has followed the adventures of slacker park-workers Mortdecai (a Blue Jay) and Rigby (a racoon) since 2010. Regular Show has built up a large following and won numerous awards and nominations, bagging the Emmy for Best Short Form animation in 2012. Last year the show was given a feature length TV movie outing, and has also spun off a successful comic book series. Just what is this "big, big way" that the show will go out? 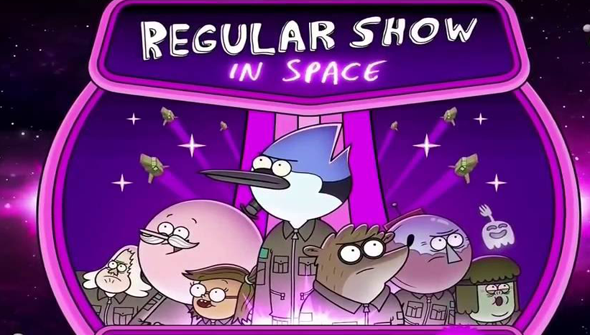 The final season is subtitled Regular Show In Space.. so we think you can probably work it out. The final season kicks of at 8pm on Monday 26th of September on Cartoon Network in the US, and will run through until early next year. The UK air date is to be announced.